Can you find the swarm? 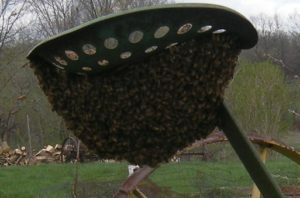 Bees typically swarm when they feel the hive is too small. They have a way to designate a new offspring to become a Queen. 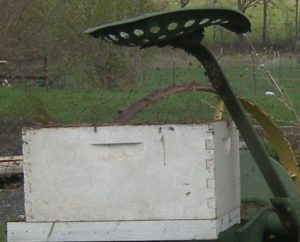 She will stay behind and manage the existing hive. The experienced queen takes her share of the workers, and the swarm heads off to find a new home. This beam was a handy landing spot. 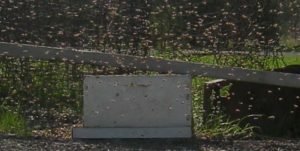 We have had swarms in the past, and they are often in tree branches. This makes them hard to reach. 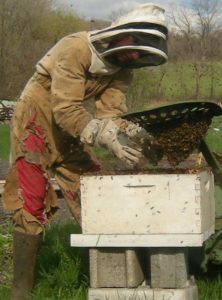 Finding a swarm close to the ground should make the hive easier to catch. The secret to catching them is to convince the Queen that you have a better home for them. 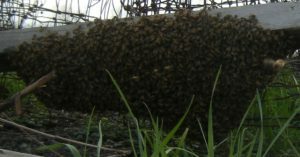 Since the beam with the swarm was nice and long, we just jostled a bee hive (technically, a “super”) next to the beam, and shook the bees in. Well, unfortunately, the queen did not end up in the box. She was on a piece of wire rather than the beam. So she took off and the swarm followed her. About twenty feet away she found the seat to our old-fashioned hay mower. Well, it is still close to the ground, so we can try again. Teen son number 2 decides that he does not care if the bees hear him coming. He bundles up and sweeps the swarm into the super. Mission accomplished? We hope so.